Our results speak for themselves. Over the years our attorneys have secured tens of millions of dollars in settlements and injury verdicts for their personal injury clients in Frankfort and Central Kentucky. We continue to represent clients in high profile criminal litigation and civil litigation throughout the Commonwealth. 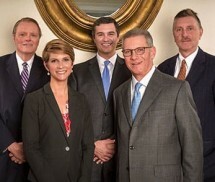 Furthermore, we are proud to represent individuals and businesses throughout the Commonwealth of Kentucky, particularly Franklin County and surrounding counties, with cases and issues relating to complex civil litigation. Our attorneys have been rated AV Preeminent* from Martindale-Hubbell, which is the highest peer-rating possible, and being listed in The Best Lawyers in America, and Super Lawyers. The attorneys of True Guarnieri Ayer, LLP have the experience, drive, and skill to get the best result possible in your case. You do not need to go to Lexington or Louisville to hire a high-quality law firm. The proof is in our results. Call us today for a free initial consultation. True Guarnieri Ayer, LLP accepts all major credit cards.